Relationships Are Games Of Calvinball | Name-Brand Ketchup. 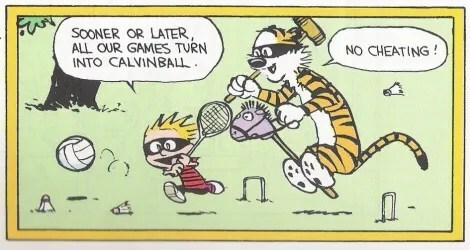 I’ve written before about how Calvin And Hobbes is the best comic strip in the history of the medium, and have alluded to the game of Calvinball. Flashes of insight come from unexpected sources. In a flash one day, I came to recognize how much that game is like relationships. How often have we all been told that “love’s a game”? They never specifiy which game, but just to be on the safe side – – – wear a cup. Pat Benatar once famously sang that love is a battlefield. Sorry, Pat, but you’re wrong – – – a battlefield has rules. 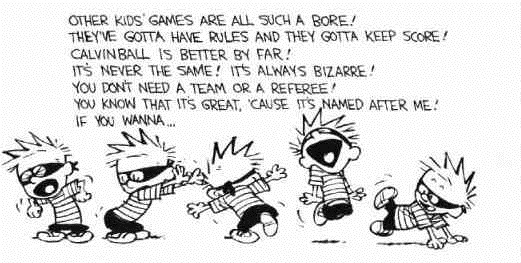 Love is a game of Calvinball. 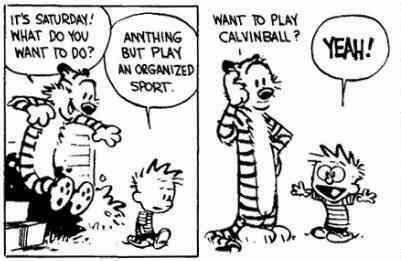 Calvinball is a game played by Calvin and Hobbes as a rebellion against organized team sports: according to Hobbes, “No sport is less organized than Calvinball!” Calvinball was first introduced to readers at the end of a 1990 storyline involving Calvin reluctantly joining recess baseball. It quickly became a staple of the comic afterwards. 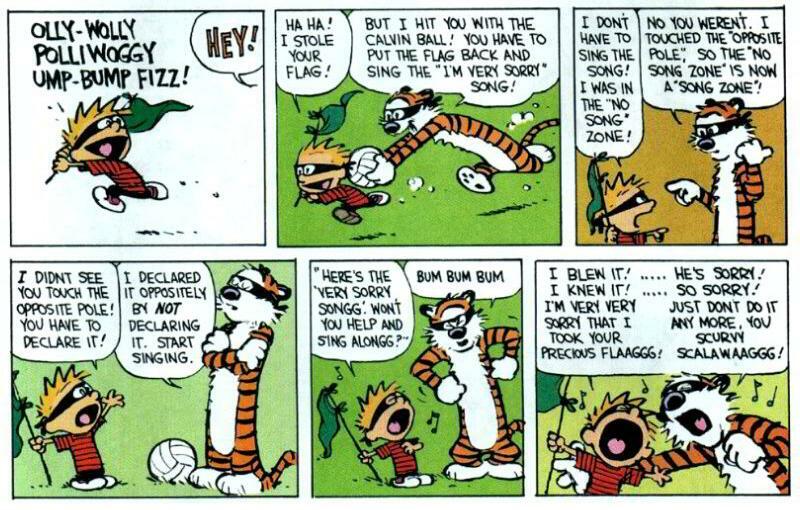 The only hint at the true creation of the game ironically comes from the last Calvinball strip, in which a game of football quickly devolves into a game of Calvinball. Calvin remarks that “sooner or later, all our games turn into Calvinball,” suggesting a similar scenario that directly led to the creation of the sport. There’s no doubt that relationships are a game of Calvinball. What worked once in a relationship, or worked in a previous one, can go horribly awry in a new relationship or even subsequently in the same one. Rules and penalties are contrived and concocted, often out of thin air. You may think that you’re winning, and suddenly discover that you’ve lost everything. And let’s face it, much as we’d like to believe otherwise, relationships aren’t often even-handed or equal. One person usually calls the shots, sets rules to which the other defers. Control over the other person: as in unreasonable, non-negotiable demands? Expectations about how you present yourself to the world? Heck, Calvinball’s got ’em. Gotta wear a mask. Can’t ask why. Speaking of penalties and consequences: Calvin was once sentenced to the “Pernicious Poem Place” and had to request an uncomfortable (and personally humiliating) penance at the hands of his nemesis Susie Derkins. Susie not only laid down the smack on poor Calvin, but dug the hell out of it too. 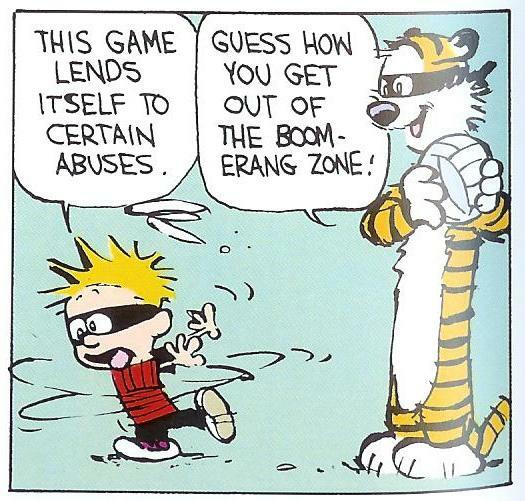 I find it fascinating that Calvin, usually a defiant rebel and not one to acquiesce, never pushes back against the penalties in a Calvinball game. Here he not only let his nemesis douse him with a bucket of ice water: he asked her to do it. That’s a hard one to fathom. Maybe, as Richard Beck says, it’s because he knows it’s a game of trust and friendship with his best friend. Maybe he knows he’ll have a chance at payback, making the odds even. And maybe, as in relationships, he knows there’s no escape from consequences. Take your lumps, lick your wounds, and carry on. This may seem cynical and I suppose it is. As mentioned above, a pervasive message in our culture is that “love is a game,” and I believe it’s necessary for survival to cultivate that mindset. You’ll make yourself crazy if you don’t. Calvinball demands the qualities needed in a successful relationship: ego strength, good boundaries, innovation, assertiveness, stamina, and an ability to detach one’s identity and self-worth from outcomes. The game’s rules are insanely convoluted, can change at a moment’s notice, and/or have bizarre exceptions and by-laws. Rules change capriciously: the players know this, so they aren’t Playing For The Win. And no cheating! It’s great if it’s between equals: it’s awful if it’s between people who hold any malice toward each other. And it’s not for wimps. That’s the single biggest similarity to relationships. I think that a similar analogy is Lucy’s football (not to be confused with the excellent blog of the same name). I fear President Obama is Charlie Brown, hoping that this time Lucy (Congress) will really, truly let him kick the ball. And we see what happens, time after time.